St. Lucia is a high, green island with a mountainous interior and a coastline with beaches. 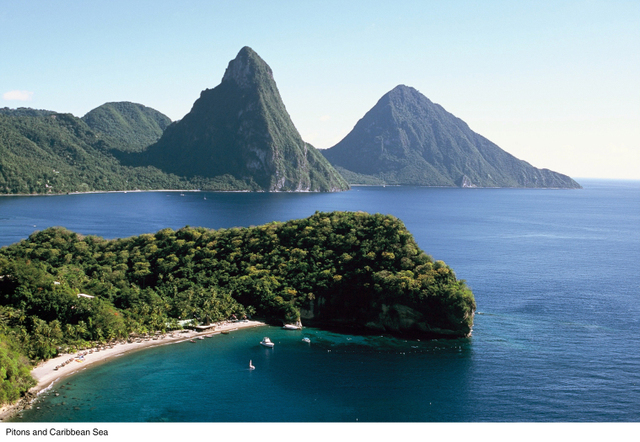 The most dramatic scenery is in the South, the twin peaks of the Pitons, the symbol of St. Lucia. We will visit Rodney bay, a large protected bay where you can explore Pigeon Island which offers fort ruins and have a white-sand beach. Castries, the island’s capital, is a large natural harbor. The liveliest part of the city is just southeast of the port, where the colorful Castries Market houses scores of produce, handicraft and souvenir stands. The vegetable market is one of the biggest of the island chain. 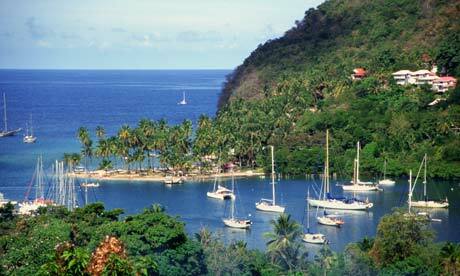 South of Castries is Marigot Bay, a lovely sheltered bay that’s backed by green hillsides and a palm beach. This bay was the setting for the movie Doctor Dolittle. Soufriere is a fishing village and named after the nearby sulfur springs. The coastal Pitons provide a scenic backdrop to the South and the islands highest peaks rise above the rain forest just a few miles inland. The main sights are on the outskirts of town and can be visited in a couple of hours. SulphurSprings:is a barren and somewhat moonscapisch terrain pocked with pools of boiling mud and steaming vents. Diamond Botanical Gardens: the gardens, waterfall and mineral baths are all at the same site. The mineral baths date from 1784. The gardens which are planted with tropical flowers and trees including heliconia and ginger specimens. At the back of the gardens is a small waterfall, what was in the movie Superman 2. Moarrne Coubil Estate: is a working cocoa and coconut plantation that gives visitors a sense of life on the farm. There are displays on the processing of copra, cocoa and manioc: traditional buildings and the ruins of a water and sugar mill.